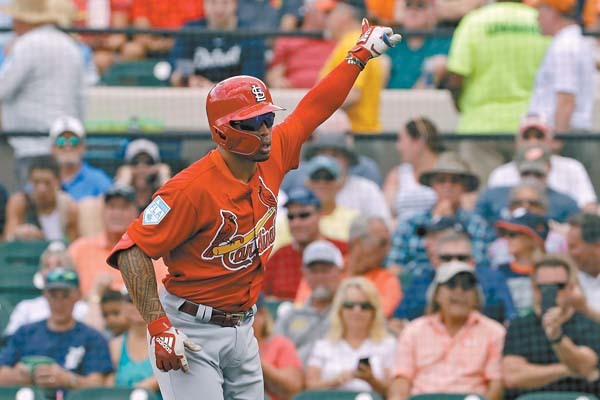 JUPITER, Fla. — Going into spring training, St. Louis manager Mike Shildt delivered the message second baseman Kolten Wong always wanted to hear. Wong wouldn’t have to prove himself. He didn’t have to be perfect. The former University of Hawaii standout from Hilo would be the Cardinals’ starting second baseman. “It’s something I’ve asked for since I got to the big leagues, just a chance to go out there and play every day,” Wong said. Last year’s midseason managerial change relaxed Wong. And a comfortable Wong proved to be a valuable player. “Kolten, last year, he may have been the best second baseman in baseball the second half of last season,” said Shildt, who replaced Mike Matheny in mid-July. A career .255 hitter over six seasons with an above-average glove, the 28-year-old Wong hit no better than .210 in any one of the three months prior to Matheny’s firing and no worse than .280 in any month that followed. Wong doesn’t believe the improvement is coincidental. Matheny’s intensity, Wong said, never allowed him to feel comfortable in his role. Wong is taking an aggressive approach this spring. Unafraid of making mistakes, he’s looking to take the extra base. At the plate, he’s able to work on his swing or situational hitting without feeling the pressure to produce statistically. Wong is hitting .269 with a homer, a double and two stolen bases in Grapefruit League play. Possessing a nice blend of power and speed, in years past Wong expressed his desire to hit at the top of the order. With Matt Carpenter and Dexter Fowler healthy, that won’t happen. Shildt expects Wong to create scoring opportunities from the bottom of the lineup.